6.00 points at 16 votes (rank 630). 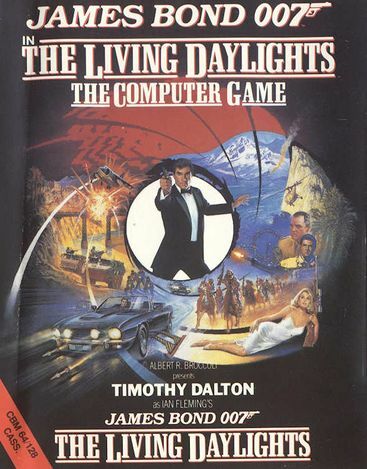 For the James Bond movie "The Living Daylights", in which Timothy Dalton played the famous role for the first time, the game was released. 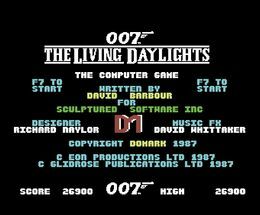 In eight levels, which are meant to show scenes from the movie, you try to steer bond through a landscape scrolling from right to left, in which all sorts of villains hide and want to make him breath his last. Of course bond can fire back, but should not hit any innocent people, as this means points will be deducted. Additionally obstacles appear that need to be jumped. 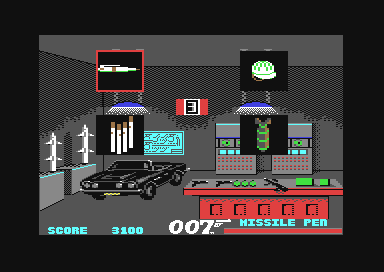 Next to his gun, which he always owns, bond can pick an additional weapon (or item) as Bazooka, grenades, night vision device, helmet, cigarettes! !, a ghetto-blaster! !, etc. from the arsenal of "[Q]" after each level. One of these weapons (items) is implicitly required in the next level. 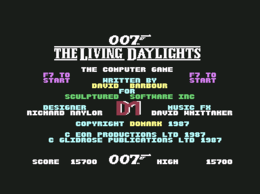 Clean scrolling and partially well-made graphics and a good, but unfortunately very short title melody. The controls need getting used to and are not solved very cleverly, as an enemy at the left border of the screen is hard to hit due to the long way of the crosslines.There is no end screen, only a short message appears after solving the game. Unfortunately, the highscore list is not saved. 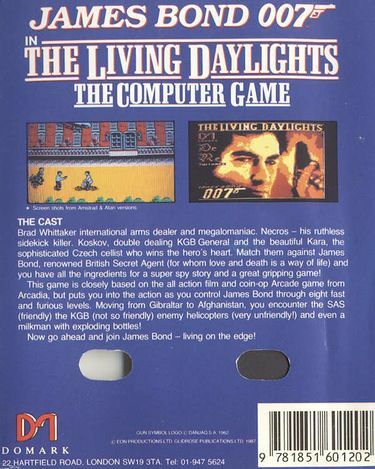 Here Bond needs to help the general of the KGB to escape. But in no case he is allowed to injure uninvolved passengers. Koskov will follow Bond, but he needs to be protected from the snipers that hide in the building. Koskov needs to be brought safely through the facilites to the Transsiberian pipeline. Thereby you need to look out for Russian guards and falling pipes. Bond has finally brought Koskov out of the danger zone, but now the killer Necros was set on him. And he does not even shrink from using a helicopter. Necros last appearance. 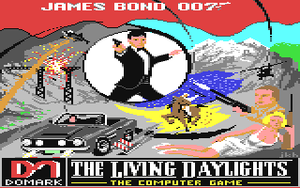 He tries to eliminate Bond with an "explosive balloon attack". Koskov was abducted and Bond needs to take him to a safe place. This turns out a type of running the gauntlet over the roofs of Tangiers. Bond needs to escape from a Russian base in Afghanistan. Bond finally meets the one who is behind all that - the weapon and drug dealer Brad Whittaker. The final fight starts. Level 1: Shoot at green soldiers with the paint-gun, at the grey soldier at the end of the level shoot with the Walther. Jump over stones lying in the way. Level 2: At the start instantly use night vision device. Only shoot at the red soldiers. Jump over manhole covers. Level 3: At the start instantly put on steel helmet. At steam exhausts (yellow) do a roll forward. Jump over pipes (white). Level 4: Use Bazooka to shoot helicopter and guards on the way. Jump over grenade holes and projectiles on the way. Level 5: Bond cannot move. First shoot 20 balloons with the crossbow, then the balloon seller with Walther. Level 6: Shoot at guards at the edge with sleep-dart-gun. Jump over walls and projectiles. Level 7: You can also bribe the guards on the way with a cigarette. But you should nevertheless equip Bond with a Bazooka. Jump over items and projectiles. Level 8: Walk forward and avoid the projectiles. When Bond has reached Whittaker, shoot at him with Walther. In the arsenal you have only 5 seconds time to decide for an item. Certain bonus items can only be used once. H.T.W: "The graphics alone do not make it! This is a game which looks rather pleasing at the beginning, but this is all. You still can get over the problem with the controls, but that each level present itself equally concerning the gameplay, makes the motivation sink strongly after a short time. Seven levels that scroll horizonally and in which you just have to shoot your way through! That you can choose the additional weapon in the arsenal does not really help either, because if you know what you need in which level, it is not interesting any more. Only level 5, the explosive balloon level loosens everything up a bit. And while I am still grumping: If you make the effort and play through the game, you would want to see an end seqeunce (or at least an end screen) and not only such a pathetic message!! 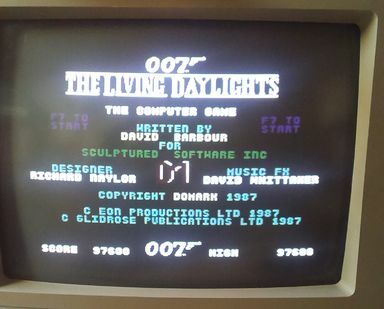 And the highscore list is of course also not saved (neither in the disk nor the tape version). In return, the difficulty grade is not that high (as even I have reached level 4 without cheat mode...), therefore fans of shooters which are also taken with Mr. "shaken, not stirred" will like it...". This page was last modified on 20 July 2017, at 12:45.